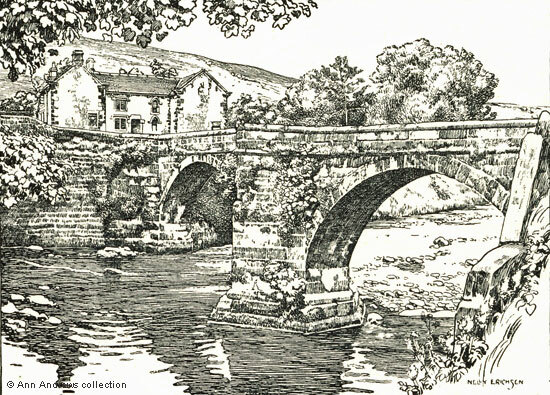 Above and below are two illustrations showing the narrow packhorse bridge which used to span the River Derwent close to Derwent Hall. 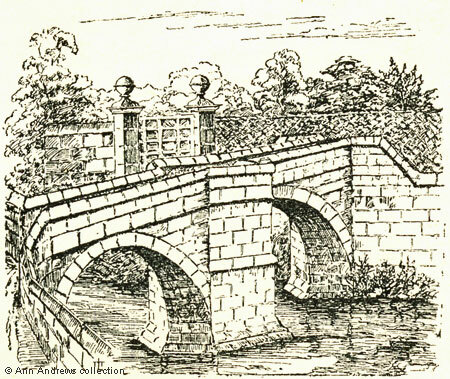 Firth described the stone bridge as "a beautiful two arched bridge ... flagged with stones like a pavement and much too narrow to admit the passage of any vehicle". He observed that the triangular recesses allowed those travelling on foot to step into them to avoid the packhorses. In the centre of the south parapet was the base of a cross or a crucifix and the bridge was believed to have been built in the seventeenth century, although both Firth and Cox described it as ancient. 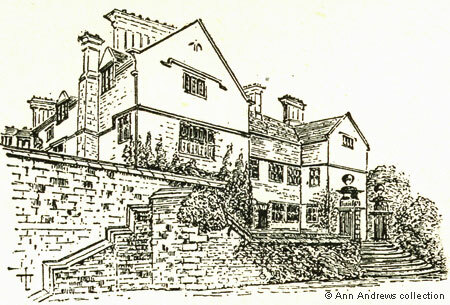 Derwent Hall (shown below), "a fine and picturesque old gable building", was built in 1672 by Henry Balguy. It was then owned by the Newdigates until it was bought by the Duke of Norfolk. The property was said to have lovely gardens. The Derwent Valley Water Board purchased the house and its land from Viscount Fitzalan of Derwent in 1927 and it was used as a Youth Hostel Association holiday centre from 1932 until 1943. In 1934 the Derwent Valley Water Board met at Nottingham to discuss constructing the great Ladybower Dam. Before the First World War it had been estimated that the project would cost £750,000 but by 1934 the cost was believed to be half as much again. It was also estimated that the Dam would take 10 years to construct. A year later "The Times" reported that the Water Board had decided to complete the programme of works they had begun in 1899, with the third instalment which included the construction of a third dam at Ladybower and construction began. Derwent Hall's fate was sealed. The historic Hall, together with the villages of Ashopton and Derwent, would disappear beneath the water. In 1939 members of Derby Photographic Society visited the Hall to take pictures for the County photographic survey. The photographs were considered to be of considerable importance as, within a few days of the Society members visit, work was to begin on felling trees and dismantling buildings to make way for the new giant reservoir. King George VI and his wife, Queen Elizabeth, visited Bamford to open the third and final phase of the Ladybower scheme which would supply water to Derby, Nottingham and Sheffield in 1945. When it was completely filled it would hold 6,300,000,000 gallons of water. The new dam had taken the estimated 10 years to build with work on the project continuing throughout the war, despite problems. The villages of Ashopton and Derwent were submerged by 1945, with only the tower of the church built in 1867 showing where Derwent village had been. The fine oak panelling and some other things were saved from the Hall. Following a public appeal to save the packhorse bridge before the war it was dismantled, the stones were numbered and then they were stored. In 1959 the bridge, by then scheduled as an ancient monument, was rebuilt to span the Derbyshire - Yorkshire boundary at Slippery Stones; the work was estimated to have cost about £3,000. 2 & 3. Pen and ink sketches from: Thomas Linthwaite Tudor (1926), "The High Peak to Sherwood, The hills and dales of old Mercia", published London by Robert Scott. With drawings by Fred Adcock and others. "The Times", 25 Sep, 1945. The Ladybower Reservoir. "Derby Daily Telegraph", 24 January 1934. Fate of villages in the balance. Completion of Derwent Water Scheme. "The Times", 29 Apr, 1935. More Water. "Derby Daily Telegraph", 12 June 1939. Visit to Derwent Hall.